With Christmas over the writing & receiving of letters became more and more important to the Hibbett Family, as they waited daily for news of the embarkation of Kitchener’s New Army to the Front. Pte Bertie Hibbett’s January Letters should be read against the background of increasing numbers of casualties reported in the Walsall Observer. The 19th Jan. Post gives details of the Zeppelin Raid on the UK at Great Yarmouth, King’s Lynn and Hull; also a list of War Items published in the Walsall Observer for January 1915. The Home Front, already outraged by the bombardment of Whitby & Scarborough in Dec.1914, begins to feel increasingly vulnerable. The War would not be ‘over very soon‘. The month of February, saw an acceleration in the training of Kitchener’s New Army, ready for Inspection by H.M. King George Vth prior to mobilisation. The 1/5th Battalion, S. Staffords were engaged not only in Field Firing, Bayonet Practice and Route Marches but also in Joint Division Trench Digging at night. The ability to ‘pack up and be ready to go at a moment’s notice’ was under constant inspection; this applied to equipment & stores – and ‘entraining’ practice for transport of horses and mules. February 1915 also saw the surprise visit of Pte Bertie Hibbett’s parents, Arthur and Marie Hibbett, with other parents from Walsall to say farewell to their sons. From now on the SOUTH STAFFORDS WAR DIARY, provides the setting for Pte Bertie Hibbett’s WW1 Letters. On 1st March the 1/5th South Staffordshire Regt. set off at last for France. The History of the South Staffordshire Regt. records:- ‘The 46th Division (North Midland ) landed in France at Havre on 3rd and 5th March 1915. Sent, after rest, to old salient outside Armentieres. 1st ‘baptism of fire’. Here Pte Bertie Hibbett and his pals underwent intensive instruction in Trench Warfare: including trench digging, wire entanglements, hygiene and sanitation, as well as bomb throwing. 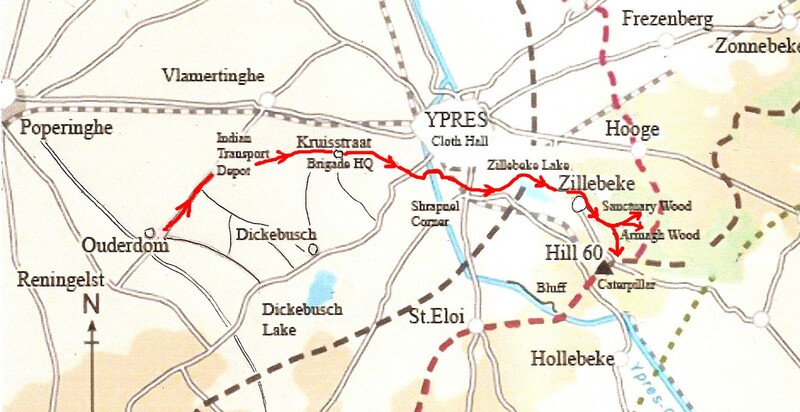 Route to the Front March 1915. 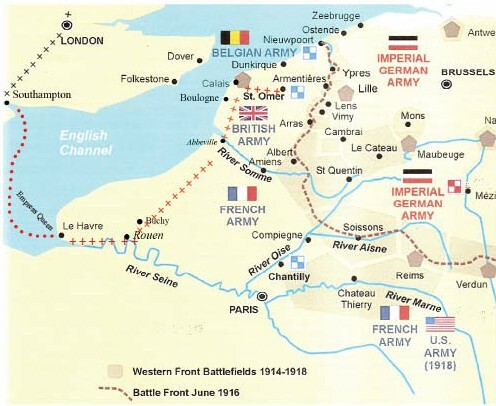 Map adapted with thanks from website ‘WW1 Battlefields of the Western Front’. EFW. 2015. 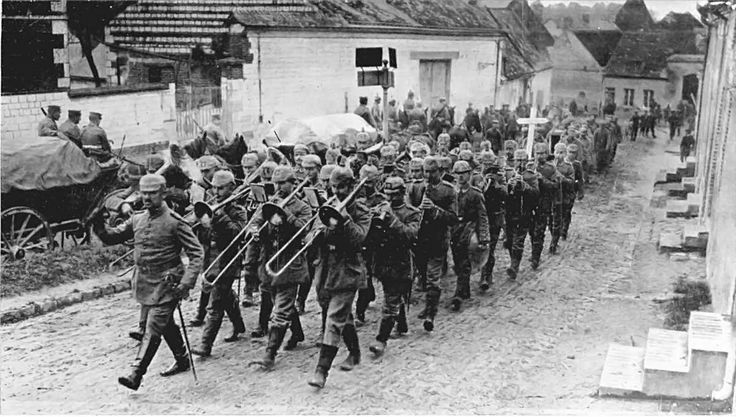 On 2nd April, the 1/5th South Staffordshire Regiment, 46th Division (North Midland) after its first baptism of fire at Armentieres, took marched north towards Ypres. 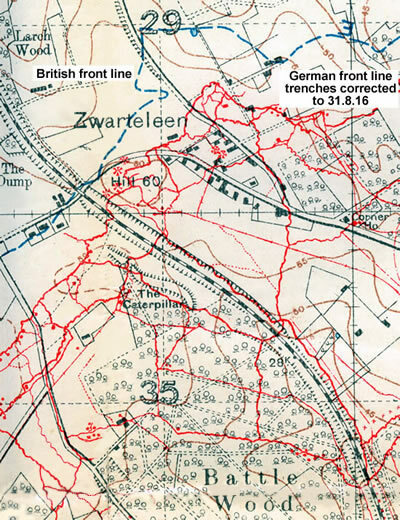 to take over a section of the Line at Wulverghem, opposite Messines (Mesen). Pte Bertie Hibbett and his QMS pals entered these notorious trenches on Good Friday. The significance of this coincidence for him is reflected in his April Letters. His tone is sober, his language often formal. He is under no illusion that his life might be very short; he could be killed or wounded in an instant. The images of suffering humanity are all around him. There is no escape. To meet this challenge to his hope of Easter, Pte Bertie draws on all the resources of his young life: his theological & biblical knowledge; his Prayer Book; familiar hymns at Church Parade and the friendship of his old pals at Queen Mary’s Grammar School, Walsall. He gleans what he can from the Chaplain’s words that they ‘must not separate Good Friday from Easter’ and he find’s peace in Nature’s eternal litany of praise at dawn & sunset. .
Pte Bertie Hibbett’s description of the long march to the Front, carrying his heavy load – a full pack – and on top of it his Mother’s parcel for his brother Sydney – (determined to share their only tangible tie with Home) – is a lasting image for me of my father’s sheer goodness and courage in extremity. CASUALITIES: KILLED: OTHER RANKS: 10 (including Pte Bertie’s friend Corporal Sanger). WOUNDED: OFFICERS: 2 (including a favourite, Lieut Parr*). OTHER RANKS: 25. TOTAL 27 (including several of Pte Bertie’s ‘A’ Company). HIBBETT LETTERS : MAY 1915. Everyday life at the Front for the 1/5th South Staffords opposite Messines (Mesen) continued in a relentless round of four or five days in the Trenches and a similar length of time on Reserve at Neuve Eglise ‘Rest Camp’. Excused parades because of ‘bad feet’, Pte Bertie Hibbett still had to run the gauntlet of sniper fire on three ration fatigues a night – a round trip each of at least 2 miles. In Wulverghem Trench 8, on Listening Post duty underground, he and his School pals endure high explosive shelling or rapid fire almost everyday. Names of casualties mounted up in the Walsall papers. 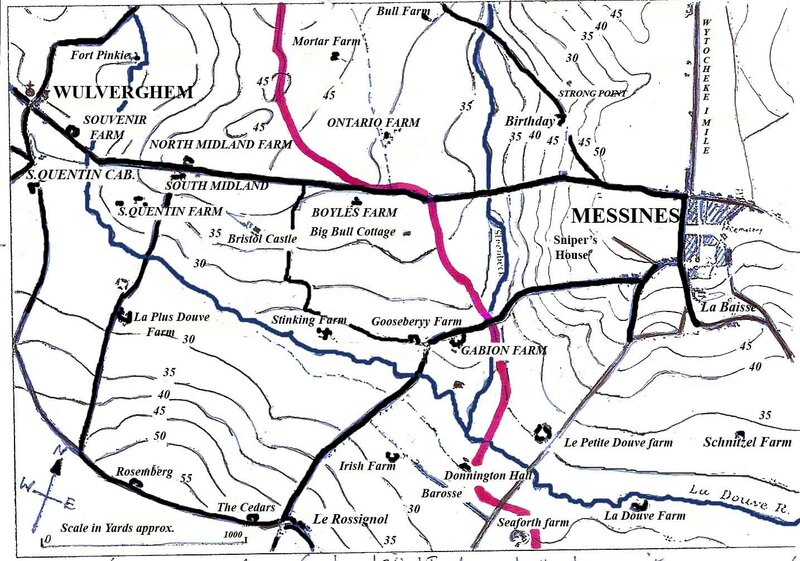 WULVERGHEM /MESSINES MAP of FARMS. redrawn by EFW. 2015. Pte Bertie writes of ‘exciting times’ but clearly hard labour, inadequate diet, lack of sleep and unhygienic conditions are taking their toll. Diarrhoea was ‘a petty complaint with the majority of us’. His friends have boils, or are ‘upset’ (‘shell-shocked’) and on top of this there is the fear of ‘asphyxiating gas’ , (first used by the Germans against the French at Ypres on 22nd April, 1915. Only 8 miles away it still caused ‘smarting eyes’. The parcels of food, sometimes buried by shelling were a welcome relief, especially those sent to celebrate Sydney Hibbett’s Coming of Age. Pte Bertie proudly reported to his parents how his brother continued to ‘grow in favour with the men’. The 19 yr old also asked his father for permission to smoke, listing a number of reasons – one of which was to counter the appalling smell of the trenches. In June, Hostile aeroplanes appeared over Wulverghem Trenches and the 1/5th Staffords responded with rifles (something my father records in My Memories of the First World War. 1967). The new Diagonal Communication Trench he helped to dig inevitably drew German attention to the British Front Line; with increased shelling by day and deadly sniping by rifle fire by night. Pte Bertie Hibbett’s Letters in June show him in a nervous, confused and over-burdened state. He writes about one particular night when he and his fatigue party were set on by Machine Gun Fire; in terror of being left behind, he had to run with a heavy foot board – and his ankles gave way. Despite his poor ‘trench’ feet and chapped hands (from the heavy manual work handling hurdles, wire entanglements and sand/ bags under fire) he felt duty bound as a ‘gentleman soldier’ to acknowledge the many letters, good wishes & parcels he had received. Rather than upset his Mother, he confided in his sister asking for her advice. He confessed that he didn’t always feel like writing letters and he felt people did not understand how hard it was to write them. He thought he might be ‘homesick’. He then felt bad for complaining and upsetting his Mother. A hundred years on it is clear to the reader that he is suffering from shell shock and sheer exhaustion of mind & body. [ NB. I often wonder whether my father was ever in trenches opposite those undergoing the same mental struggle, those who would so profoundly influence the world for good after the War (in terms of psychology, theology, biblical interpretation, art history & politics) Or for evil? – a certain Corporal Adolf Hitler is known to have sheltered in the Church at Messines, possibly when my father was opposite in Wulverghem trenches]. On 25th June 1915, the 137th Brigade was relieved by 4th; 6th & 7th Northumberland Fusiliers of 149th Brigade. Leaving their much improved Trenches, praised as ‘ a Model to the British Army‘, 1/5th South Staffords marched on to ‘hotter parts’ – OUDERDOM CAMP & the RAILWAY DUGOUTS overlooking YPRES. Pte Bertie Hibbett (recommended by RAMC for a ‘Rest’ ) had a ride there in an ambulance. CASUALTY NUMBERS for JUNE were fewer than for MAY. OTHER RANKS: KILLED 4; WOUNDED 12 (mostly during night fatigues). Accidentally wounded 2. The Staffordshires had been ‘lent to’ General Plumer’s 2nd Army, along with several other Battalions. At Ouderdom Reserve Camp (after turning out the 5th Leicesters who had just settled into their bivouac field) they occupied their time with Working Parties and 6 hour rapid-marches in full pack. This was to prepare them for the five-mile trek to Armagh Wood Trenches near Zillebeke. ROUTE to the FRONT from Ouderdom Divisional Reserve via Indian Transport Depot, Shrapnel Corner & Hellblast Corner to Zillebeke, Sanctuary Wood, Armagh Wood & Hill 60. Red Dotted Line is Front Line in 1915. In Armagh Wood Trenches – & later the S.W. Slope of Hill 60 the Staffords experienced their ‘most trying time yet’: – with shellings 2–3 times a day; mines; high explosive ‘whizz-bangs‘ and rifle grenades ‘sausages’; increased aeroplane activity (reconnaissance & fighter planes); patrols to within 20 yards of the enemy; and sap digging for Bombing Parties & Listening Posts in galleries underground. All this – as well as enduring constant sniping at night & during relief (called ‘Hate Time’). It was an exhausting time, psychologically as well as physically. Yet it is in his July 1915 Letters that my father first speaks of his future –his sense of a ‘calling to the ministry’ and ‘destiny for Holy Orders’ as a priest. At the end of the month the Commanding Officer, R. Richmond Raymer for the first time records 5 self-inflicted wounds, only one of whom survived, a measure of the physical & emotional exhaustion of the men. CASUALTIES FOR JULY: OTHER RANKS: KILLED 7. WOUNDED: 26. Slightly Wounded 10 (remained at duty). SELF-INFLICTED WOUNDS: 1. DIED OF WOUNDS: 4. Pte Bertie Hibbett had been ‘recommended for a rest’ by an RAMC doctor as far back as 25th June, i.e. even before he left the Wulverghem Trenches and needed an ambulance to Ouderdom, Divisional Base, Ypres Salient. In August he endured a further two weeks hard labour under almost constant fire before he was at last sent to the B.E.F. Base Rest Camp in Rouen. Within a couple of weeks he was recorded as ‘unfit for entrenchment’ and sent to No 6 Ward, No 9 General Hospital, one of the many Hospitals for wounded soldiers in Rouen. The 1/5th South Staffords battled on holding the Line at Hill 60 and under constant threat of being blown up by enemy mines under Trench 35 ‘Bomb Corner’ 36 & 37. The R.E successfully recovered a total of 1250 Ibs of explosives, black powder and Lignosit from a German mine – and where fumes prevented them from recovering more, they managed to cut the wires leading to the charge, a highly dangerous procedure. It was Lance Corporal Sydney Hibbett who had engineered his brother’s ‘Rest’. In a letter to Bert at Rouen he ‘earnestly’ advised him not to ‘miss any chance of being sent to England – & not be misguided by any desire to return here just because I am here’. R. RICHMOND RAYMER, Lt. Col., Commanding 1/5th South Staffordshire Regt. 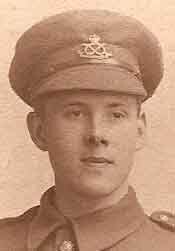 By 1st September 1915, Pte Bertie Hibbett had been in Hospital at the B.E F. Base, Rouen for four weeks, suffering from boils. Soldiers lingering so long in Hospital would most likely have been given a ‘Blighty’ and been transferred to U.K. Hospitals. But Bertie Hibbett’s blood disorder was apparently a common complaint, not one that received general sympathy in the Army; he hoped for a Blighty but expected to be sent back to the Front any day. Bertie’s brother, now Corporal Sydney Hibbett, & the 1/5th South Staffords, (137th Brigade 2nd Army) was holding the Line on Hill 60 (scene of heavy fighting in May); the Germans held the higher ground and in some places, such as Bomb Corner, the trenches were only 50 yards apart. The British suffered many casualties from enemy underground mine explosions and continuous shelling of trenches and dugouts. Working Parties trying to repair trenches (that were little more than parapets) came under incessant rifle fire and suffered many wounded. The 2nd Army planned a major offensive for the end of September. Hospitals were no doubt under pressure to get their Up Patients mended as quickly as possible. Pte Bertie Hibbett found himself in khaki again on 5th Sept. despite pain ‘like toothache in the neck’, giving him sleepless nights on end. Fortunately, within two days, an observant Doctor sent him back to Hospital, when it became obvious he was in no fit state for Active Service. Corporal Sydney Hibbett, with other NCOs of the 137th Brigade, received Operation Orders on 24th Sept for action at 12.30 am on 25th Sept. The 137th Brigade was to cooperate with the general offensive by keeping enemy salients under artillery rifle and machine gun fire, with special attention on suspected enemy observation posts in front of the Brigade Trenches. If the wind was favourable a curtain of smoke was to be directed on Hill 60 and the Caterpillar. I take this to mean that 1/5th Staffords were not expected to charge that day but to keep the enemy distracted from charges likely to be more successful up the Line towards Ypres. CASUALTIES FOR SEPTEMBER 1915. KILLED 3. WOUNDED 25. SLIGHTLY WOUNDED (remain at duty) 15. DIED OF WOUNDS 2. (Deaths of 2 men wounded in August advised during Sept.). On October 1st 1915 the 1/5th South Staffords (2nd Army under General Plumer) left Railway Dugouts, Zillebeke and went 40 miles south to the Hohenzollern Redoubt, a mining area of pits, shafts and spoil heaps, regarded as the strongest German stronghold on the whole of the Western Front. Attached now to the 1st Army (commanded by Sir Douglas Haig) they were to take part in 46th North Midland Divisional attack on the Redoubt, a renewal of the Battle of Loos (pronounced Loss) begun on September 25th. On 12th October 1915, the 1/5th Battalion entered the Trenches East of Vermelles intent on taking ‘Big Willie’and ‘Fosse 8′.. They had a Field State of 28 Officers and 827 Other Ranks: Total 855. Their Battle lasted from 12.00 noon 13th October until midnight 14th/ 15th October with 322 Casualties. CASUALTIES:- OFFICERS KILLED 5; OTHER RANKS 41. OFFICERS WOUNDED 6. OTHER RANKS 41. DIED OF WOUNDS: OFFICERS 2; OTHER RANKS 3. WOUNDED & MISSING: OFFICERS 0. OTHER RANKS 52. TOTAL CASUALTIES: 13 OFFICERS & 309 OTHER RANKS. Signed: R. RICHMOND RAYMER, Lt. Col. Cmdg. 1/5 Bn. South Staffordshire Rgt. NB. 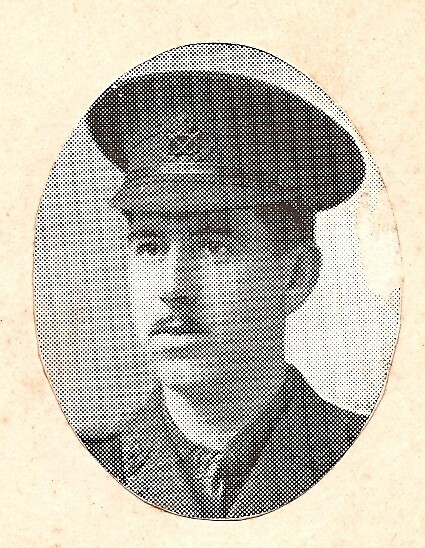 Corporal SYDNEY HIBBETT was in the Battle having returned from Home Leave on 5th Oct.
Pte BERTIE HIBBETT was on guard at Rouen Station but arrived at Bethune in time to witness the Battalion returning from Vermelles Trenches. ‘The finest March Past I have ever seen’ he wrote in his Little Book of Words & Doings. ‘Hats off, war-worn, muddy look … with a smile at me‘. The 1/5th South Staffordshire Regiment spent a month re-fitting after the Battle of Loos-Hohenzollern. They were billeted in Allouagne and Fouquieres,villages around Bethune. Sydney Hibbett, now a Sergeant, one of the ‘Glory Boys’ of the Battle (as Bertie Hibbett called them), was heavily involved in preparing and practicing for King George Vth 2nd Review of Allied Forces in France on 27th October. The week before the Review the weather had been very wet indeed –‘driving winds, flying clouds, bitter cold and heavy rains nearly every day’. Pte Bertie was on a Bombing Course but was able to visit his brother at Fouquieres every evening until 1st November when he found Sydney and twelve others had been sent to Hospital in Rouen with influenza. Waiting for the King, ‘Wet through … standing inches deep in mud & water for hours’ with ‘the cold wind driving rain in our face’ had wrought a heavy toll. The King fared no better for he fell off his horse and was seriously injured. Approx. Front Line from Vermelles to Neuve Chapelle Trenches Oct-Nov. 1915. efw 2015. On 5th November Pte Bertie Hibbett and 1/5th South Staffords marched to Paradis, near Merville and on the 9th to Riez Bailleul. There they went into Neuve Chapelle Trenches to relieve 1/1st Gurkha Rifles. They held the Line from Brewery Road to Hill Street – with 4th Battalion London Regt on their left and 4th Battalion Kings Liverpool Regt on their right. For the rest of November the ‘Enemy was very quiet’. The 1/5th South Staffords alternated in the trenches with 1/6th Battalion North Staffords; 4th Battalion King’s Liverpool Regt; 1/5th Battalion North Staffords and 1/6th South Staffords. They became familiar with evocative names along the line: Oxford Street, Loretto Road, Lansdowne Post, Church Road, Liverpool Street and Moggs Hole. CASUALTIES for November 1915 were light: OTHER RANKS KILLED 1. WOUNDED 4. Slightly Wounded 4. War Diary for November signed by H. A. WISTANCE, Captain Commanding 1/5th South Staffs Regt. HIBBETT LETTERS: DECEMBER 1915 & JANUARY 1916. Pte Bertie Hibbett hinted strongly in his December Letters that by January 1916 the 1/5th South Staffords were destined for the Eastern Front. Before then Bertie hoped he would at last get some Home Leave. By the end of December all three of the Trio, Sydney and Bertie Hibbett and their QMS pal Vernon Evans were in Hospital. At the beginning of December 1915, Serjeant Sydney Hibbett was moved from No 12 Hospital ‘special treatment ward’, Rouen to ‘Z’ Company Convalescent Camp. For some time Bertie was puzzled about his whereabouts since a Field Post Card had been returned to him marked ‘Not at Base try Front’. 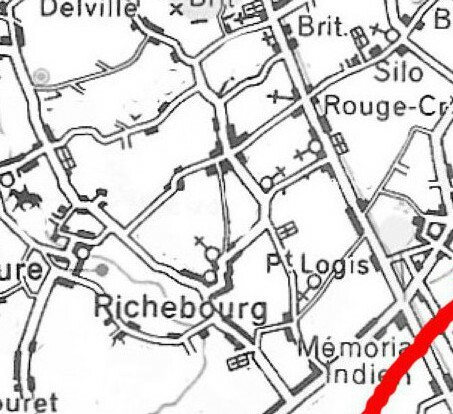 The 1/5th South Staffords were about to move from Neuve Chapelle, Loretto Road Billets, and begin Battalion training at Rue des Vaches and Pte Bertie was anxious to discuss with his brother the possibility of applying for a Commission. He did not feel at all eligible but felt pressured by his family (in their mistaken hope perhaps that he would be safer & have better accommodation as an officer). The possibility of a desk job for him as an orderly clerk at the Divisional Head Quarters had also been suggested. On 8th December Bertie at last heard from his brother. Sydney had been diagnosed with ‘catarrhal jaundice’, given a ‘Blighty’, fixed with a label marked ‘Boat Sitting Up’ and, after an ‘exciting’ Channel crossing, found himself in a Red Cross Hospital in Cirencester. On 19th December the 1/5th Staffords left the Front Line and marched to billets in Isberques (10 miles north-west of Bethune) for Platoon & Company training. On 25th Dec. they entrained at Berquette Station for Marseilles. and on 2nd January 1916 they embarked on the HMS Magnificent for Egypt, but Pte Bertie Hibbett was not with them. Before or during the long march to Isberques he was sent by Field Ambulance to the Division’s Casualty Clearing Station at Merville, near Estaires, suffering with trench foot. There he spent a lonely Christmas, without parcels or letters from Home. The psychological effect of the War is clearly reflected in his letters; so also the strong support he received from the Army Hospital Chaplain, whom he was to meet again when training for the Anglican Ministry. It was at Merville that Bertie asked a wounded soldier how he had spent Christmas 1915 and received the reply: ‘We had nothing but we went over the top to shake hands with the enemy’ and ‘the enemy came over to play their band’. None of Pte Bertie’s January Letters have survived apart from that of New Year’s Day. By 16th January he was dismissed from Hospital to join Transport (Notts & Derby’s?) at Isberques, and then sent on to join his Regiment. 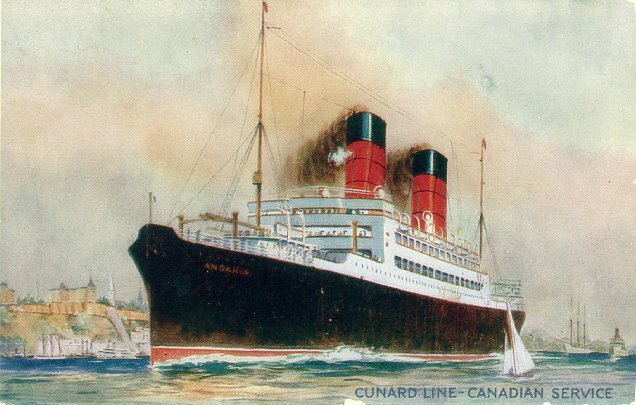 He got as far as Marseille and went on board S.S. Andania – for one night only. The next day he was sent back to the Western Front. Sidi Bushr Brigade Camp, Alexandria, Egypt. 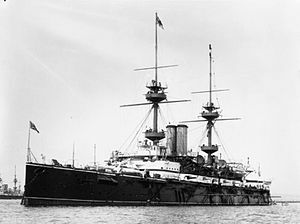 Meanwhile, HMS Magnificent carrying the 1/5th South Staffords arrived in Egypt on 9th Jan. (the same day the disastrous Gallipoli/Dardanelles Campaign (begun April 1915) came to an end). From Alexandria they entrained for Shallufa, took over No. 5 Post, No. 1 Section Canal District for seven days and spent the rest of the month in Battalion Training. By 31st Jan. they were back in Alexandria at Sidi Bishr Camp; and by 5th Feb. they were on their way back to France. The British Army under Earl Haig had decided to concentrate on a ‘Big Push’ on the Western Front – The Battle of the Somme. CASUALTIES: DECEMBER 1915: KILLED 1; WOUNDED Nil. Signed: R. RICHMOND RAYMER, Lt. Col. Cmdg. 1/5 Bn. South Staffordshire Rgt. CASUALTIES: JANUARY 1916: ACCIDENTALLY INJURED (on board ship) 2 (sent to Hospital); 5 (remained at duty). Signed: Major WISTANCE. Cmdg 1/5th Battalion South Staffordshire Regt. HIBBETT LETTERS FEBRUARY – MARCH 1916. In February 1916 the 1/5th South Staffordshire Regiment after Bn training in Sidi Bishr Camp, Alexandria, left Egypt on board the S.S. Transylvania – en route for Marseilles and the Western Front. The British Army was preparing for a ‘Big Push‘ to break the Trench & Crater Warfare and finish the War. From Marseilles they entrained for Port Remy and marched to Bellancourt, a small hamlet north-east of the Cathedral City of Abbeville, arriving on 14th Feb. Pte Bertie Hibbett was already at Bellancourt (with Notts & Derby Transport) billeted on a farm. According to his Letters this appears to have been one of his happiest times in France, despite the lack of communication from Home. A friendly farmer, the landlord of his billet, invited him to a meal with his family every evening. He was acting as M.P. over the billet and this was a chance for him to try out his French much to his & their amusement. Lists of vocabulary appear in his ‘Little Book of Words & Doings’. He promised to keep up with farmer Joe Albene after the War & with Buckshee Ichbe Singh Waltu (whose photograph he had sent Home from Marseilles). Pte Bertie Hibbett rejoined the 1/5th S. Staffords when they arrived back from Egypt and on 22nd Feb. he marched with them to Prouville to spend the rest of the month in Battalion Training. A tragic Bomb Accident occurred on 28th Feb. resulting in 15 Casualties, when a grenade exploded in a Sergeant’s hands. SUMMARY OF FEBRUARY CASUALTIES. KILLED 1. D.O.W. 1. WOUNDED 12. SLIGHTLY WOUNDED 1. remained at duty. Names. From 1st -13th March the 1/5th South Staffords were kept on the move, marching from Prouville to Occoches (x miles); to Estre-Wamin (x Miles) and Magnicourt, 17 miles north-east of Arras; on to Aubigny (x miles) until they arrived in the Brigade Division Reserves at Ecoivres (x miles) close to the Front Line. The state of my father’s poor feet can be imagined, there is no evidence he was excused these route marches. At Ecoivres three 1/5th S Staffords Lewis Gun Teams relieved three similar Teams of 5th North Staffords in the Trenches at Neuville St Vaast. On 19th March 1/5th entered the Trenches, east of Neuville St Vaast to relieve the 6th South Staffords. They faced a very trying time of shelling and grenade attacks and of disappointment at the inaccuracy of their own Artillery Support; shells were busting inside their own lines. The climax of the month was the German bombardment of 25th March followed by successful explosion of a German mine. SUMMARY OF MARCH CASUALTIES: OFFICERS KILLED Nil. WOUNDED 1. OTHER RANKS KILLED 1. WOUNDED. 7. Signed: H.Lord. Major. Cmdg. 1/5th South Staffordshire Regt. The Hibbett Letters of April 1916 are amongst the most poignant & heart-wrenching of all my father’s Letters Home. He had been at the Front for over a year without Home Leave and the whole of his time at Neuville St Vaast must have seemed a long and painful Lent – an eternal Good Friday of suffering & death. Since the 18th March the South Staffords had been at Neuville St Vaast holding the line known as the Labyrinth – an extensive underground system of caves and passages on the south-east slope of Vimy Ridge, just north of Arras. Pte Bertie Hibbett lived in one of the Labyrinth caves –‘the way down long and squeamish. . . like Linley Caverns but no picnic in Warfare’. He was also a volunteer for Listening Post, one of the most dangerous of positions deep underground. On 29th March he was glad to find his brother Sydney asleep in the cave (returned after 4 months’ sick-leave in England) but full of sorrow that he had returned to ‘such extremity’. In his War Diary ‘A Little Book of Words & Doings’ (and in his 1967 ‘Memories’) Pte Bertie records the ‘Bust Up’ of 2nd – 4th April when the Germans exploded 3 mines underground. The 1/5th War Diary hides the result under ‘Casualties’ & my father’s letters give no description of what he must have witnessed – wounded, dead and dying comrades – and the bodies of his young enemies. Instead he identifies everything he sees with the Passion of Christ and the Way of the Cross and his mind is focused on the suffering of his Mother and Family. He is anxious to persuade his youngest brother Basil not to attest on 1st May but to wait until he is conscripted – for the sake of his Mother. He feels it his duty to be cheerful and to comfort his pals at the height of the bombing but the tension takes its toll. He is not recorded as a ‘casualty’ but he is sent for a ‘rest’ behind the lines rather than back to the trenches with his Battalion. On Palm Sunday he stands on guard duty at the ruined Monastery of Mont St Eloi and recalls the words of Jesus from the Cross ‘Eloi Eloi lama sabachthani’ (My God, my God why has thou forsaken me’). His Good Friday Letter quotes ‘Father Forgive them for they know not what they do’ and he tells his Mother they should shake hands with the enemy on this day, even more so than on Christmas Day. Finally he is spared a ‘long march to Calvary’ when, relieved at last by the 11th Cheshires, the 1/5th South Staffords set out on their 10 mile march in full pack to Brigade Reserve at Ecoivres-Chelers. He goes before them by Field Ambulance.